Converts all popular audio formats from one format to another and extract all your favourite CD tracks into MP3 or WAV ( CD Ripper ) with ID3v2 Tag Editor supported and burn MP3 or WAV files to Audio CD. This program can supports conversions of ( from and to ) MP3 ( MPEG Layer-3 ), WAV PCM ( WAVE sound files ), Ogg Vorbis, WMA ( Windows Media Audio ), VOX ( Dialogic ADPCM ). 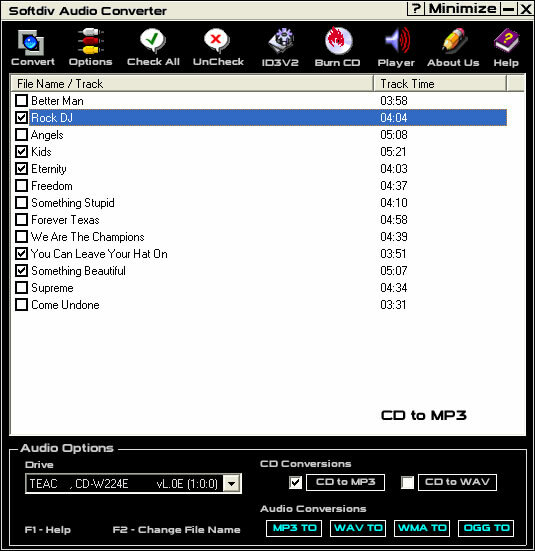 This program also extracts Audio CD into MP3 or WAV. With as simple as a click, you can convert a track in less than a minute and the whole CD tracks within a few minutes without losing the audio quality. This program can convert MP3 to WAV, MP3 to WMA, MP3 to OGG, MP3 to VOX, WAV to MP3, WAV to WMA, WAV to OGG, WAV to VOX, WMA to MP3, WMA to WAV, WMA to OGG, WMA to VOX, OGG to MP3, OGG to WAV, OGG to WMA, OGG to VOX, CD to MP3, CD to WAV. Softdiv Audio Converter can also works as CD Player and MP3/WAV/WMA/OGG Player with awesome visualization. Right-click quick convert and Audio CD burning features is now supported.